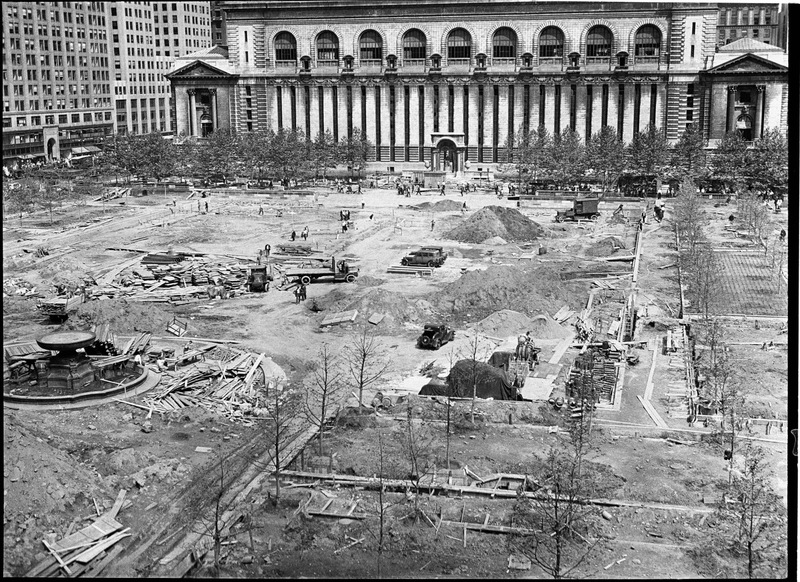 In this post, BPC’s archivist Anne Kumer, shares the history of the 1934 re-design and renovation of Bryant Park. 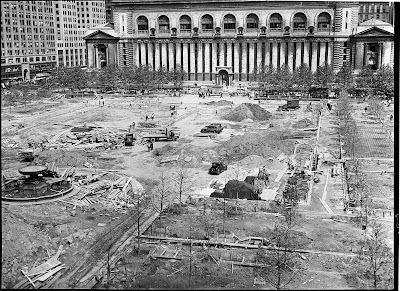 Over the years, Bryant Park has undergone numerous physical transformations. 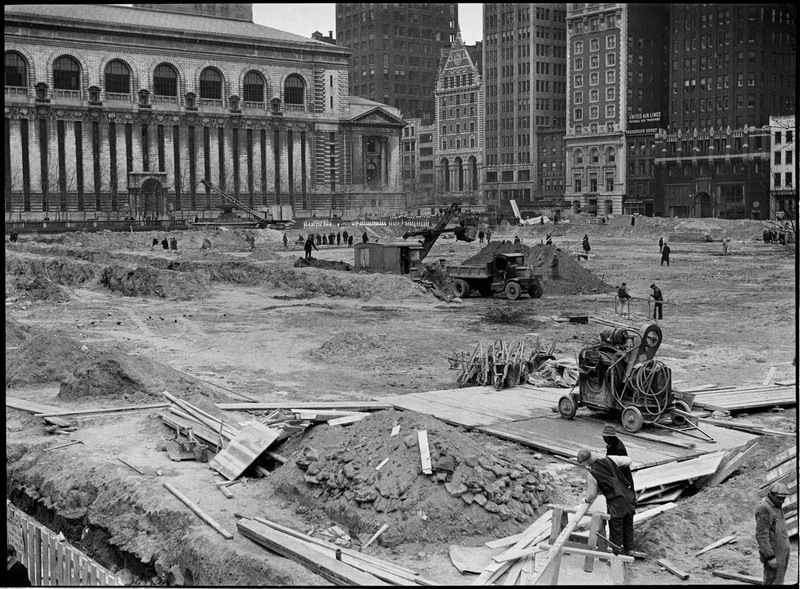 Some temporary, such as Citi PondSM at Bryant Park -- which, to the delight of ice skaters, opened last Friday, October 29 -- and others more permanent, such as the 1934 renovation of the park headed by then Parks Commissioner Robert Moses. 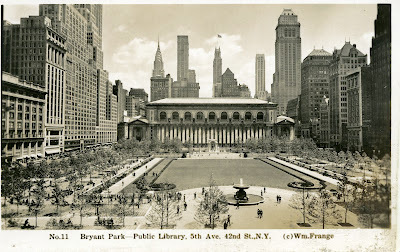 Assisted by consulting architect Aymar Embury II, and landscape architect Gilmore D. Clarke, Moses transformed the grounds of Bryant Park from a Victorian greensward to a French Classical landscape very similar to today’s design. Before Moses set to work, Bryant Park was laced with winding paths, broken up by small clumps of trees, and lined with wood and cast iron benches, common elements in Victorian Era landscaping. The paths encouraged park visitors to meander, while the trees provided shade as well as an air of mystery to what lay directly ahead on the path. The benches supplied a bit of ornamentation as well as seating for patrons. As part of the Moses Renovation, the Josephine Shaw Lowell Memorial Fountain was moved from the east end of the park, directly in front of the William Cullen Bryant monument, to the west end at 41st Street and 6th Avenue, where it sits today on what we call the Fountain Terrace. An expansive lawn was added in the center of the park space. London Plane trees were planted along allées lining two sides of the lawn’s perimeter, which was also bordered by a stone balustrade. 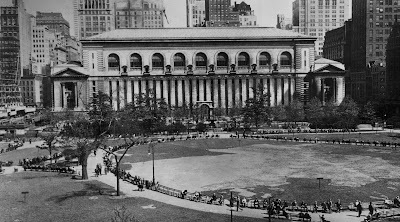 The park re-opened to the public on September 14, 1934. Mid-1930s postcard showing the park after the Moses Renovation. 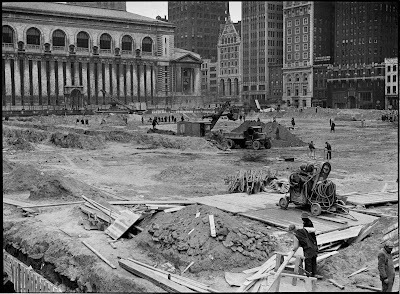 To learn more about Bryant Park’s history, before and after the Moses Renovation, click here.